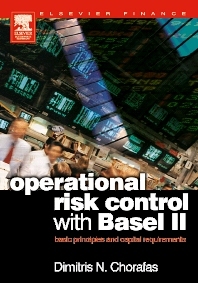 Operational Risk Control with Basel II, provides a sound methodology for operational risk control and focuses on management risk and ways to avoid it. The book explains why and how information technology is a major operational risk and shows how to integrate cost control in the operational risk perspective. It aslo details analytical approaches to operational risk control, to help with scorecard developments, explains the distinction between High Frequency Low Risk and Low Frequency High Risk events and provides many case studeies from banking and insurance to demonstrate the attention operational risks deserve.